You are at:HomeUncategorizedWhat IS that weird object used for anyway??? What IS that weird object used for anyway??? This will be my last post before I announce the winner of the iPad 2. If you haven’t entered to win it yet, go HERE. Tomorrow (Sunday the 28th) will be the last day to enter. This post isn’t about the iPad 2, though. I have appreciated all of the visits to this site by new people over the last few days. There are a lot of new names and faces showing up in that Google Friend Connect area in the name of that iPad 2. I hope you will want to stick around after I announce the winner soon. It would be fun to get to know you through your comments and my return visits to your sites. Let’s all hug! For some reason I feel compelled today to tell you about one of our favorite places to visit in downtown Houston called The Heritage Society and want to see if you can guess the point of the last object pictured on this post. (the “corners” are rounded) because the people believed evil lived in the corners. I have two sons, ages 3 & 6, that I tote around to different places to visit around town. This summer we hit The Heritage Society 2 or 3 times. We visited it before then as well. When I tell my sons that we are going to visit this place, they cheer. CHEER. 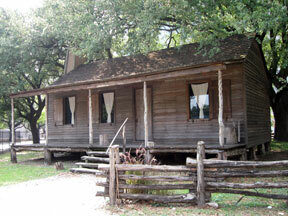 The place is situated on 10 acres and has 8 or so historic homes datingn from 1823 to 1905. When we visit, we pick 4 houses and tour them with a docent who knows our names by now. In March of this year, we were feeding the ducks on the property and I fell into a hole. I thought I broke my leg! I freaked out a bit when my leg started getting bright purple from my mid-calf to my ankle. Because I am a bit of a drama queen, I posted the picture on Facebook where several people urged me to go to the Emergency Room. My husband thought I should give it a few days, but…I went anyway. With my mom. I laid down quite a bit of cash for that visit and, as you can probably guess, my leg was fine. Boo. I wanted a cast. If I had a cast, my childhood dream of getting people to sign my cast and offer their chair for me when I wobbled up would have finally come true. I am always careful of deep holes when we visit there now. Holes and hobos. There are a lot of hobos wandering around (hobos isn’t politically correct, is it?). I saw one doing all of his laundry (2 shirts) in the dirnking fountain. The last time we went to the place, my 3-year-old tried to use it. I tackled him like he was a loose pig on a farm before he could reach it. Do you know? See the wrought iron heart bottom? See the candle with the little nail sticking out at the bottom of it? And the coils? Yes, I know you have eyes. 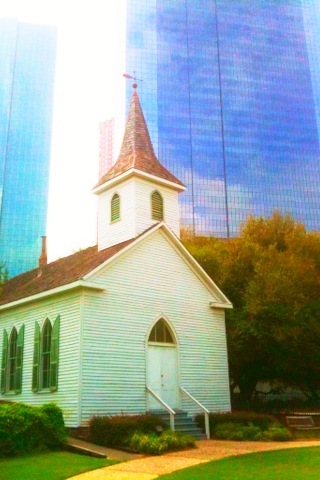 While you are taking a minute to guess, take a look at THIS picture below that I took of a church not too far from my house. 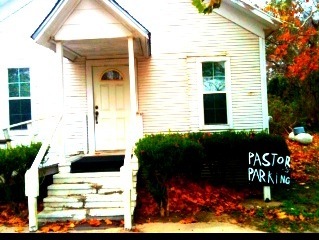 The sign the parishioners painted in the front makes me giggle every time. I absolutely love it. Do you know the point of the wrought iron object yet? It’s a date timer. The parents of the girl being called upon would light the candle while their daughter was out on the front porch with her boyfriend. If they liked the young man, they turned that coil so that the candle sat at the very top. If they didn’t like him, they wound the candle down to the very bottom. 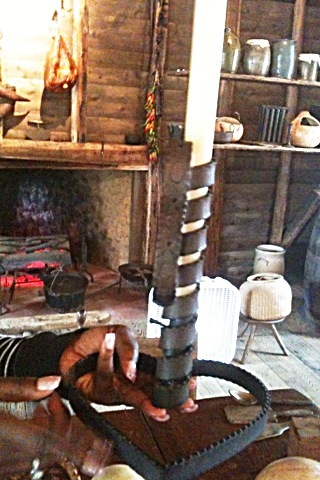 Once the candle melted to the top wrought iron ring, the date had to be over. So, the more candle sticking up, the longer the date lasted. You know every boy that prayed for a lot of candle when he walked into that house. You already knew about that date/candle trick, didn’t you? Are you a genius or something? Okay, that’s it for a few days until a winner is picked for the iPad 2. Good luck!